KTAL/Channel 6/Shreveport is losing its evening anchor. 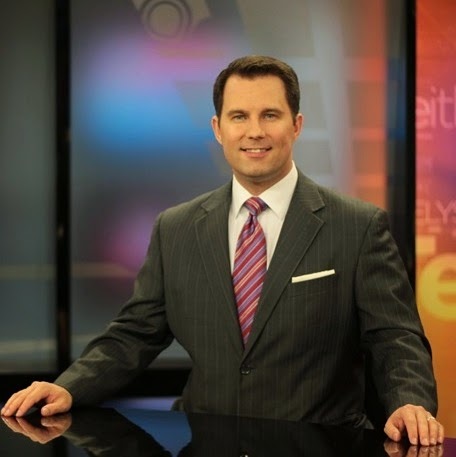 TV Spy reports Nick LaFave is moving on to WZZM in Grand Rapids,MI as weeknight anchor. LaFave came to KTAL August 2011. There is nothing more important to my wife and me than family. Our three years here in Shreveport have been an absolute blessing. But, we have missed our friends and family far more than we anticipated. And, during that time, members of both sides of our family have battled some serious health challenges. Those challenges made the distance much more difficult to bear. That distance will now be much less. I'm happy to announce that I have accepted a position with WZZM, the ABC affiliate in Grand Rapids, Michigan. Beginning in September, I join Juliet Dragos co-anchoring the 5, 6 and 11pm newscasts. It's an ubelievable opportunity I've been given to do a job I love around the people I love. My wife and I simply couldn't say no. The people of the ArkLaTex and NBC 6 have our unending gratitude. When KTAL brought me in, my wife and I were somewhat nervous. Would we fit in? Would we make friends? Would you, the viewers, accept me... a kid from the Upper Peninsula of Michigan? The answer was an absolute 'yes' in all instances. We've been treated with nothing but kindness from our very first day here. You've tuned in to watch every night, engaged me on social media every day, stopped me at restaurants and stores to say, 'hi,' and you've tolerated my constant hockey references (which I've REALLY appreciated!). To KTAL, I'm so happy to have been a part of the turnaround here. The viewers recognize the improvements we've made as we've established ourselves as a rock solid, quality product they can depend on night after night. I'm proud of what we've accomplished and humbled to have been a part of it. I have every confidence NBC 6 will continue to improve. The people here are simply too talented for that to not happen. To the people of Western Michigan, I look forward to getting to know you on a nightly basis. I'm coming home, and I don't plan on leaving again. 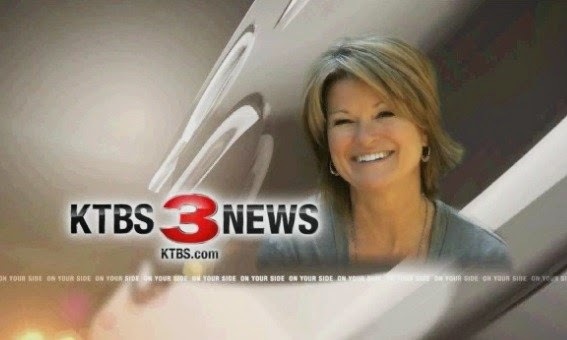 Source:KTBS.com KTBS is pleased to announce that Sherri Talley is returning to the KTBS 3 News desk, Monday, August 4th. “I’m so excited to be back with the team that has a sharper-than-ever focus on good, quality journalism,” said Sherri Talley. Talley is referring to KTBS’ commitment to In-Depth and Investigative journalism. Upon her return, Talley will have reporting responsibilities in addition to her role as anchor. Viewers know Talley from having watched her report and anchor in the ArkLaTex for decades. A few years ago, Talley left the news business to pursue other opportunities in public relations and social media. She will rejoin old friend and colleague Gerry May on KTBS 3 News at 6:00. Talley left KTBS abruptly in April 2011. Since then she has work with the United Way and started her own PR firm. FTV Live reports the first casualty of the Sinclair purchase of the Allbritton broadcast stations. WJLA/Channel 7/Washington DC General Manager is getting the axe. Bill Lord sent the email to his staff stating September 30th will be his last day at the station as Sinclair is terminating him from that position. Now that Sinclair Broadcasting's $985 million deal with Allbritton has been approved by the FCC, Robert Allbritton is looking forward to the future of the properties under his control. Allbritton is still the publisher of POLITICO nd owner of its parent, Capitol News Company, as well as its sister company, CapNY, publisher of Capital New York. Politico reports the Sinclair/Allbritton deal should be complete by August 1st. Reuters reports the FCC has approved Sinclair Broadcasting's purchase of Allbritton's broadcast TV stations. The deal includes KATV/Channel 7/Little Rock. Thursday's approval "exemplifies the careful scrutiny the (FCC) will provide to broadcast transactions that propose new combinations of sharing arrangements and financial entanglements between a dominant licensee and a so-called sidecar entity," FCC Media Bureau Chief William Lake said in a statement. "The Media Bureau has demonstrated clearly that it will not allow such combined arrangements to undermine the local TV ownership rule, which is in place to ensure competition and diverse voices on the airwaves." With just days left until the deadline for approval the Justice Department Tuesday cleared the way for approval for Sinclair to purchase Allbritton's TV station properties. Broadcasting and Cable reports the Justice Department declared it has no antitrust issues with Sinclair's purchase of Allbritton's TV broadcast assets..which includes KATV/Little Rock. NOW it's on to the FCC for approval before the July 27th deadline. Sinclair Broadcast Group, Inc.announced today that it has launched the American Sports Network ("ASN"), a collegiate sports initiative to be broadcast on a number of Sinclair's broadcast television stations, and has entered into comprehensive sports rights agreements with a number of distinguished NCAA Division I conferences including Conference USA, the Colonial Athletic Association, Big South Conference, Southern Conference, and Patriot League. The initiative will be led by Doron Gorshein, Chief Operating Officer of Sinclair Networks, a division of Sinclair, who joined the Company in January 2014. The announcement was made by David Smith, President and CEO of Sinclair. Under these agreements, Sinclair will premiere an extensive slate of live, local sporting events, including football, basketball, soccer, and other sports with the opening of this year's college football season. The initial launch will include over 50 universities and colleges. These local, live, exclusive games will be broadcast in different regions of the country, including where the conferences are located. Sinclair's broadcast stations will either be carrying the games and original content as part of the primary program line-up (generally on the Company's CW and MyNet affiliates) or as part of second channels (sub-channels of the primary station's signal), complimented by access and distribution on digital platforms. Subject, among other things, to successfully securing carriage agreements with distributors in the future, the Company's plans may include potential development of new cable networks and digital platforms focused on these new content initiatives. In addition, other television broadcasters have expressed an interest in distributing the games in their markets. Additional content and distribution elements will include programming that showcases the colleges, students, and student-athletes, focusing on their aspirations and achievements. "Broadcasters serve and are closely connected to their communities, of which the colleges and universities are an integral part," commented Sinclair Networks COO, Doron Gorshein. "We believe there is significant value and consumer appeal for live sporting events from these important institutions, and we can offer expanded distribution through our broadcast platforms, as well as on potential new platforms, deepening our connection to our communities. We're proud to be working with the Conferences on this initiative, which combines compelling local sports and related content, with enhanced localism, diversity, and positive social purpose." 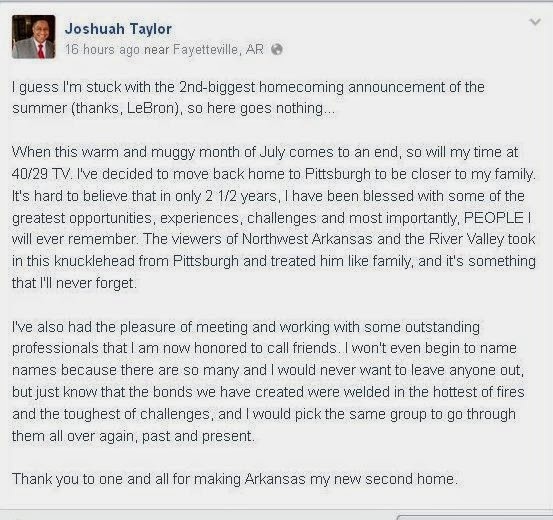 KARK has hired a new anchor/reporter. Shannon Miller with Nexstar's KOLR/Springfield, MO posted on her facebook page is leaving and moving to Little Rock. In Springfield Miller was the morning and mid-day co-anchor. From what her bio on KOLR's website she apparently has worked in northwest Arkansas at one point..it doesn't mention what station she worked for. A start date at KARK is not known...or what newscast she will be anchoring. Should KATV Start Looking for a New Home? Well it seems KATV might not only be getting new owners but also looking for a new home. 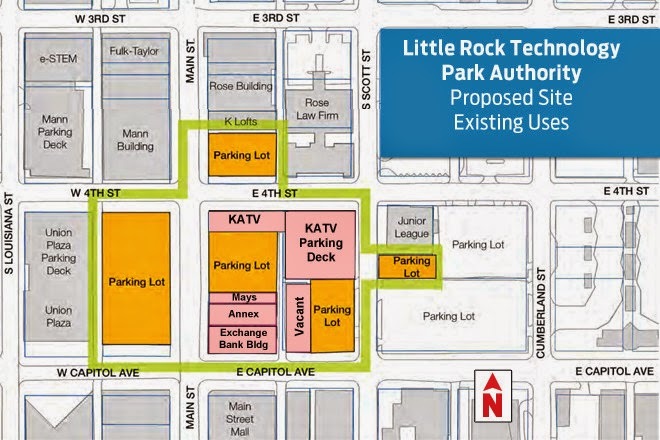 Arkansas Business.com reports the Litte Rock Tech board has recommended a parcel of properties in downtown for the new tech park that includes the KATV building. Of course this is just the beginning of the process. Now they will be assessing and getting costs together for what the all properties are worth and how much money is needed to acquire the properties.